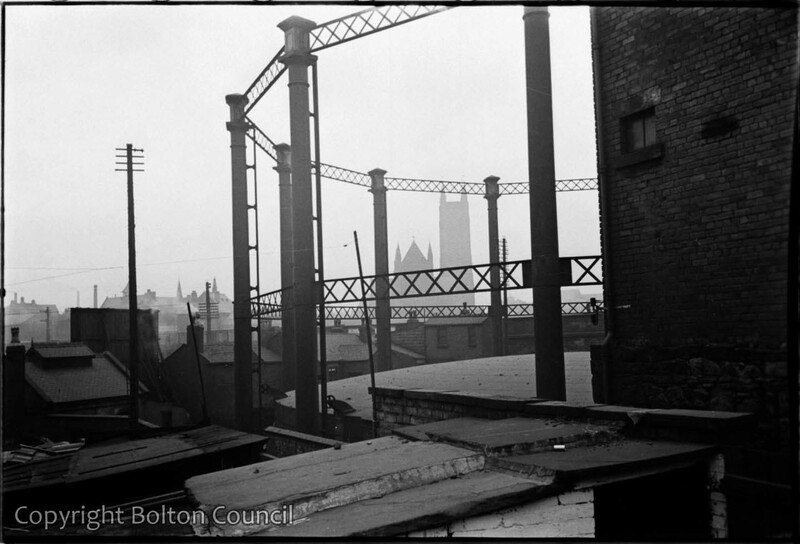 A view of rooftops and Bolton Parish Church framed by a gas holder, Lum Street, Bolton. The gas holder is still at this location (2012). This photograph was taken from a position due East of Bolton Parish Church. Lum Street is to the North East of the Church. The roofs/chimneys, immediately beyond the gasometer, are those of the shops on Bury New Road. The stone flag roofs, in the foreground, cover the toilets in the backyards of premises on Bury Old Road. I suggest this photo was taken from Eagle Street, which is more or less on the same level as the railway. The land in Lum Street is on the same level and there were far more houses between there and the and the Church and no railway. The featured gasometer had been demolished by the mid 1950’s but the water filled base remained for some time. This gasholder was detached from the rest of the Lum Street gasworks; being on the other side of the railway. Although it was there in my lifetime, I don’t remember it although I have seen it shown on maps.